I love the way you have grouped the trees and shrubs. How big is your property? We have one third of an acre. We back on to a park so have the advantage of "borrowed landscape"
Gorgeous, wish my garden was like yours! This is the nicest garden I have ever seen. Well done. Keep up the good work. Impressive border.... my azalea's have not come into flower yet! Hi - this is gorgeous!!!! Do you have a list of the different plants you have used? If I could get my garden half as beautiful it would be great. Michellm - we use conifers and evergreen shrubs as the main backbone, and then have acers and deciduous azaleas interspersed to add interest, movement and colour. We play on the colours red, blue (conifers) and yellow, and alternate tall plants with short ones and try to vary the shape and form of the foliage. Everything is pruned to keep it in proportion - and that includes pruning acers both in March and again in late May/June. I'm just going to go out now to start tackling the acers because they have gone wild with this recent spell of warm weather! Very, Very Nice, I would love to add some colour evergreens like those. Did you grow them from small or get them from the garden centre. They can prove a tad expensive. I also would love a list of those plants. This part of the garden is 17 years old. However, we keep all the plants pruned so they don't get out of proportion. 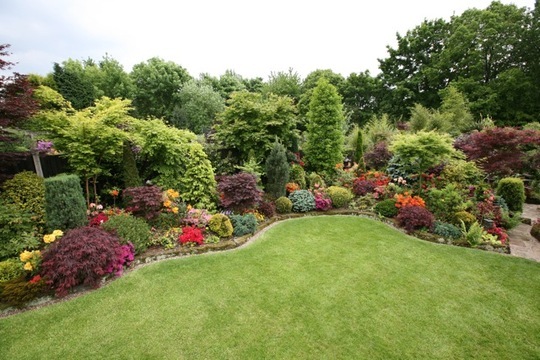 Conifers, aucuba, holly, pieris, red robin, skimmia and berberis are the mainstays, with acers and azaleas (both evergreen and decidious) in between. This is a spectacular garden and autumn at its best. Well done. Its an added benifit with natural trees in the background, gives an extra sense of depth and hight don't you think ?